Week two has come to a close! Amazingly we are now half-way through our field season. 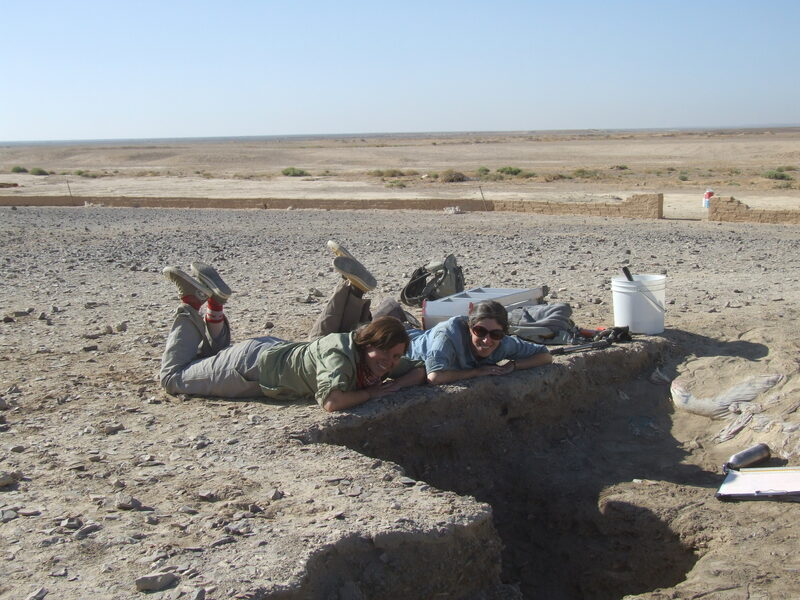 Excavations continue at Kharaneh IV, with Olivia, Trine, and Abdulkareem joining me to work on site. Meanwhile, Renata and Joe stayed back at the dig house to help with laboratory work and flotation with Adam and Dobrina. We said goodbye to Adrian and Tom at the beginning of the week. They wrapped up most of the octocopter flying to capture the site with high-resolution photography. As well, they did some kite photography to get great images of the site and surrounding wadis at higher altitudes. This week Olivia will be finishing off the high-resolution photography with a camera on a pole (photos to come). On site we continued to excavate two 1×1 metre squares get to the level of Structure 2. Thankfully, by the end of the week we had reached the same level as the 2010 excavation areas, exposing the sediment just above the structure. 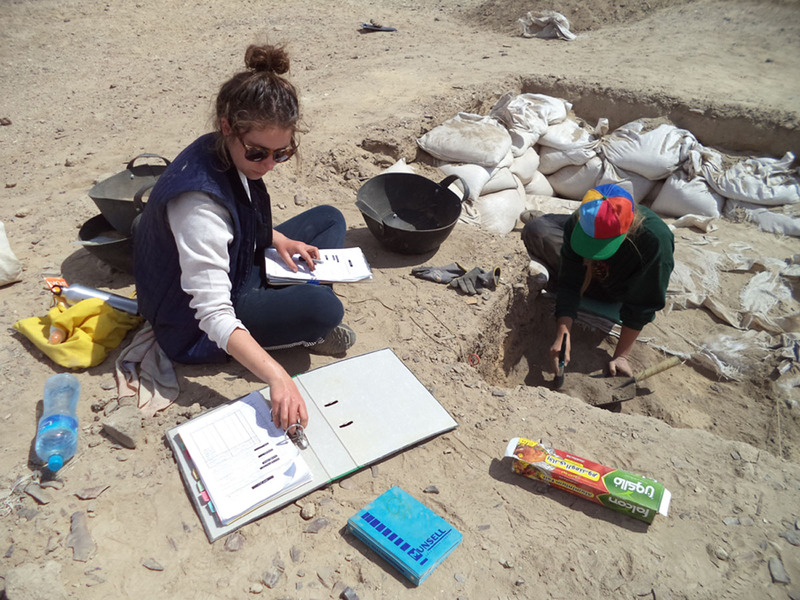 At this point we gridded the excavation units into 25×25 centimetre squares for better horizontal control and began to excavate with spoons (a highly effective method for collecting sediments from small areas). In addition to point-proveniencing artifacts, the 25×25 cm excavation areas allow us to retain a high level of spatial control for the artifacts coming from flotation samples. The same strategy was used during the excavation of Structure 1 in 2013 and this will allow us to compare the distribution of artifacts and faunal remains between the two structures. The spatial distribution of materials within the structures will give us an understanding of how people organized their domestic space in the past. Excavations will continue next week to fully expose the surface of Structure 2 so that the distribution of artifacts can be mapped. The week finished off with a day at the dig house working on lab work to catch up on lithic and faunal analysis. 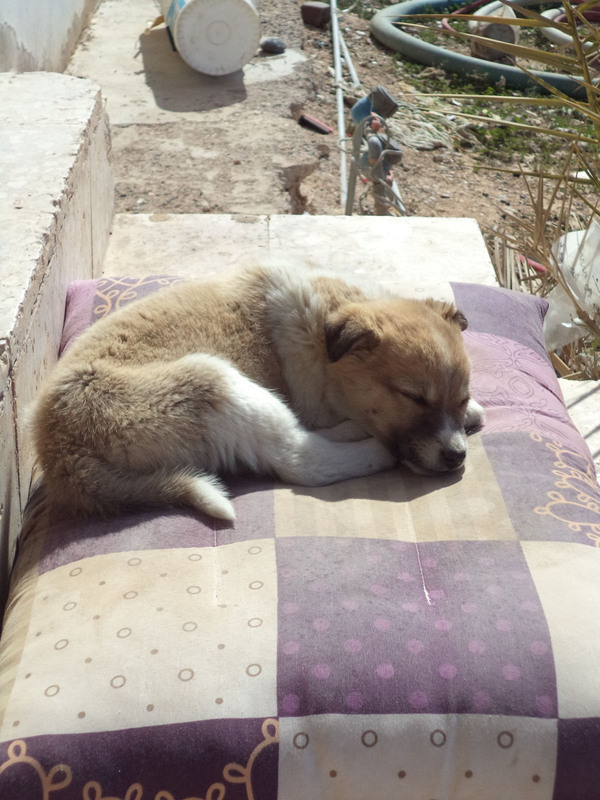 In addition, we have adopted an abandoned puppy who was wandering in the souk. He has now become an integral member of our team! Kharaneh IV 2015 excavations begin! We just wrapped up Week 1 of the Kharaneh IV 2015 field season! It is good to be back in Azraq, this time in March when the weather is cooler (it even rained on site one day!). This year we are returning to one of our old excavation areas, Area B, to continue excavations that we had started in previous seasons. Back in 2010 we uncovered evidence for two hut structures but did not have time to fully excavate them during that field season (http://journals.plos.org/plosone/article?id=10.1371/journal.pone.0031447). So we returned in 2013 with a small crew to excavate Structure 1. This year we are reopening Area B (the Early Epipalaeolithic Area) to expose, map, and excavate the second structure that we uncovered in 2010. In addition to the excavation, we are excited to have Adrian and Tom from the Fragmented Heritage Project (www.fragmentedhereitage.com) joining us. They are laser scanning the site and flying an octocopter to capture high resolution images of Kharaneh IV’s surface (and the millions and millions of lithics!). More blog posts on their work will be coming up. This year’s team is composed of an international assortment including people from Canada, Jordan, the UK, Denmark, Bulgaria, and Brazil. This has led to a range dinner conversations analysing cultural eating habits from around the world. Their enthusiasm for lithics, bones, and flotation has made lab work lots of fun! This year we are splitting the team between the lab and the field, with half the crew working in the lab, half in the field, and then rotating them so that everyone has the opportunity to excavate. The first day on site we unbackfilled Area B to get down to the level of the structure that we had exposed in 2010. We left these deposits covered with sandbags to protect them as we opened up two new excavation units to fully expose the hut. Abdulkareem, Joe, Renata, and I worked quickly to remove the upper disturbed sediments to expose the in situ deposits underneath. We are now excavating through good deposits and by the end of the week we started to expose what I believe is a bone midden uncovered in 2010. Hopefully we will be at the surface of the Structure 2 deposits by the middle of next week. Meanwhile in the lab, Adam has been busy analysing fauna from Structure 1 that we excavated in 2013, with the help of Trine who has been sorting bones for him. Dobrina has been floating samples from Structure 1 and we hope to have most of them floated by the end of the season. Olivia has been dividing her time between helping in the lab and working with Fragmented Heritage to survey the site. In the afternoons we have all been sorting lithics, of which there seems to be an endless supply. At the end of the week we took a much deserved break in Madaba. Rested and relaxed, we are excited to start week 2 of excavations tomorrow! Welcome to the new Kharaneh IV website! Welcome to the new website for Kharaneh IV! Follow this page for blog postings from the field and the lab. News and project updates will be posted here as well.